Some industrial electrical contractors simply install basic wiring and lighting for warehouses and industrial buildings and say they perform industrial electrical contracting services. John J. Pempek, Inc. knows a true industrial electrical service includes more than simple wiring and lighting fixtures. As your industrial electric contractors, we will provide maintenance and support for the machines at the core of your manufacturing process. 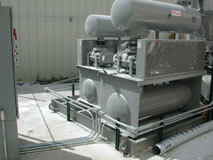 Why John J. Pempek for your Industrial Electrical Needs? Provide power, maintenance, and industrial electrical services for every machine in your production line. We can integrate your machines and subsystems in your overall electrical system, to keep them working efficiently and cost-effectively. And, we provide 24/7 emergency industrial electrical services to lower the downtime during any mechanical issues in your facility. Whether you need industrial electric contractors to repair your complex network of high-end components or you have an undocumented system with open switches and fuses nearly a century old, our electrical service can repair, maintain, and improve your system, keeping it operational. This type of update often includes changing out defective, old or inoperative components during active production, reducing the lost production time of a construction outage. 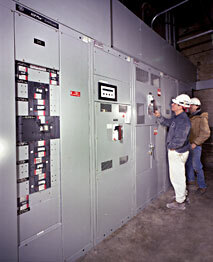 John J. Pempek, Inc. and team, serving the Chicago metropolitan area, are experienced industrial electrical contractors. Our crews function as an extension of your maintenance and engineering staff. 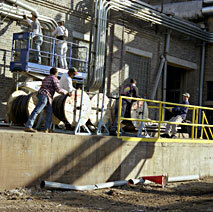 We can augment your in-house crews when needed with full-time, temporary, or on-call service. We can provide support for your critical services to assist in heavy maintenance periods, holiday shutdowns, or when you have depleted maintenance crews due to vacations and other reasons.